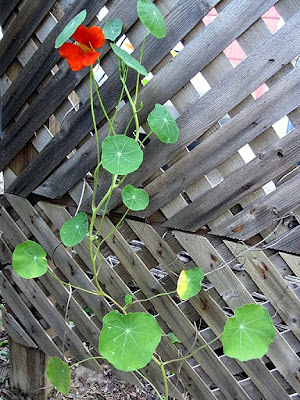 It's time for the July post for the Seed GROW Project, organized by Mr. Brown Thumb, with nasturtium seeds (Tropaeolum majus 'Spitfire') donated by Renee's Garden. Roooar! I love the fringed end of the petals, which I didn't even see until I downloaded the macro photo! 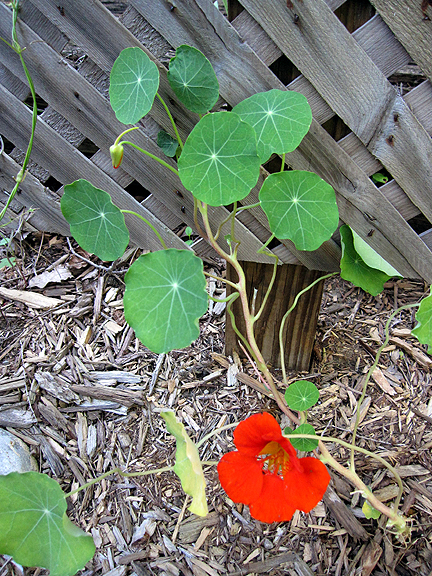 My three nasturtiums, which I affectionately call nasties, are still going strong. This one started climbing the trellis all on its own. This one needed a little coaxing. And re-coaxing. ...and should be tall enough to start climbing the corn any day now. 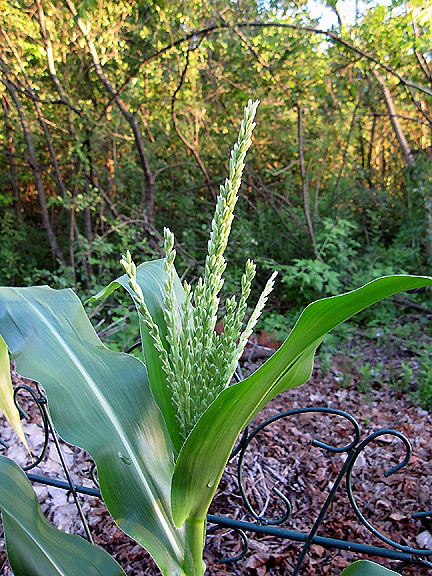 Isn't the corn ('Bantam') tassel cute? Noogie. I only have this one plant, should I be making like a bee and pollinating? I grew it mostly as an experiment to see if it could be winter-sown. The staples in my veggie garden are tomatoes, which I grow in ridiculous quantities, a few hot peppers, and an eggplant. Then I like to mix it up a bit and try different plants each year, even if they aren't the most practical solution for my conditions, just to watch them mature from seed to plant to harvest. As a gardener, I just like to know veggies. Well, that's it for nasties, but as long as you're still here, let's look at some of the other things growing in my garden. First and foremost, tomatoes! Yes, I have eeny beeny, teeny tiny fruits on five of my (ahem) 18 tomato plants, including 'Big German Pink,' 'Trifele,' and 'Red Short Vine' (all camera-shy). But 'Green Zebra' (which I can't help pronouncing ZEBra not ZEEbra due to certain English people) has twins! The black cohosh (Actaea (formerly Cimicifuga) racemosa) on the north side of my house is one of my favorite big-impact plants. It's pretty up close, too. I like how it starts blooming from the bottom up. 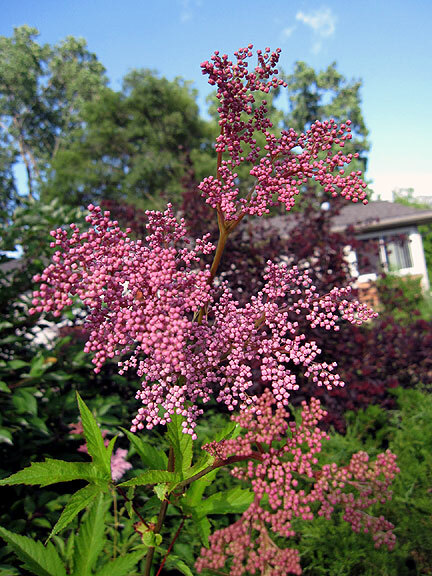 Another big-impact plant (about 6 feet tall) is queen of the prairie (Filipendula rubra). I first saw it during a tour at the 2005 International Master Gardener Conference in Saskatoon, Canada, and knew I had to have it. I thought the buds looked pretty cool, too. 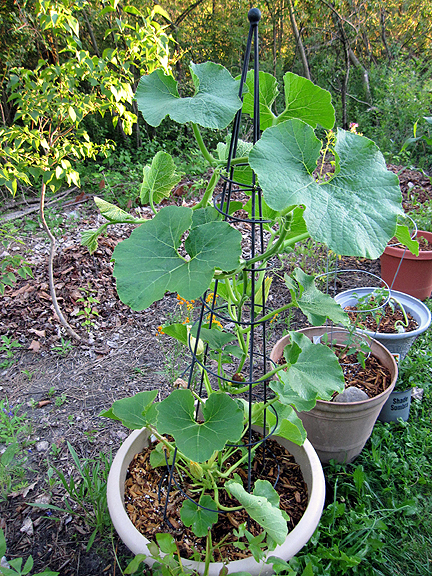 This 'Uchiki Kuri' squash is doing well. I like putting crazy growers in a container because I don't need the optimal amount of fruit. I've successfully grown zucchini and eggplant in containers, too. 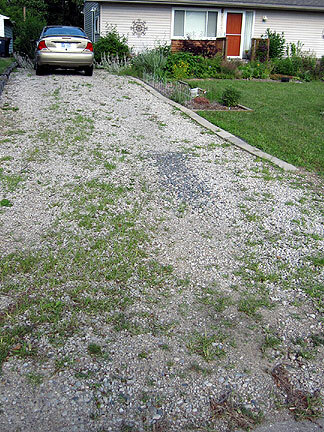 But it also means I'm going to have to mow my driveway (ha!). These are the common "ditch" lilies. I love them. I think if we take the time, we can see new things in familiar faces. 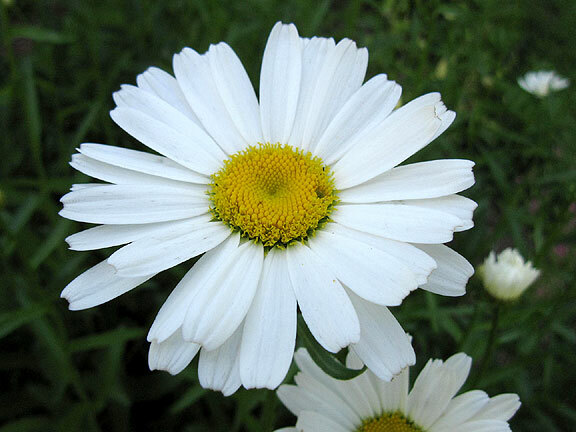 Shasta daisies always make me smile. They are in a huge clump, about 5 feet wide and nearly as tall. I just love the orange cosmos, which look pretty good next to the chocolate cosmos. 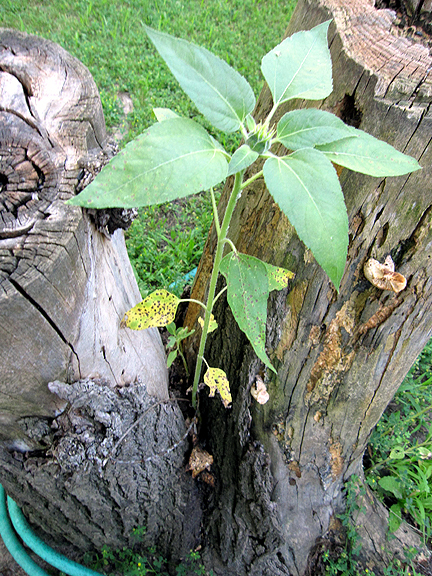 I wasn't surprised a volunteer sunflower was growing in my backyard tree stumps, because I feed the squirrels there in winter. 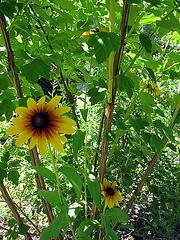 I was, however, amazed to find four sunflowers growing in the front garden in the shaded interior of my ninebark shrub. And finally, eight years ago today, Fiona found me. She had been abandoned by her previous family and decided I looked like an easy mark who she could train pretty easily. She is pleased with my ability to provide food, water, and various cat plants, but is amazed at the number of other basic commands I haven't mastered. Love your garden. I hope I can be part of the nasturtium grow project some day. I wish my tomatoes were as far along as yours but at least I have flowers. There is hope. Mine started to bloom too and have been eaten by some darn pest! I'm pretty sure that one corn plant will not produce for you 'cause it is pollinated by wind and you need more plants. Some suggest that you need a planting of 10X10 (minimum) but I've seen people get a ears from a space as small as a large plastic tote. Hi Monica, your garden is on a different blooming schedule than mine. The Queen of the Prairie is finished blooming and my Cohosh is not booming as yet. If it doesn't rain sometime soon I don't know when it will bloom. Even the grass is beginning to go dormant. Love the Nasties too. I can't seem to get them to grow here. You must have perfect weather for the daisy too. I have trouble growing them. Not enough sun in the back garden and not enough water in the front. Have a good weekend. Happy 4th. Your nasties are looking great. Now I want cohosh. Must have it. Those nasties look great! Mine, the ordinary variety, not 'Spitfires,' aren't doing so well--some got engulfed by weedy grass during our downpours two weeks ago, and the seeds I started in a pot drowned due to the same rain. Wonder if it's too late to try again. 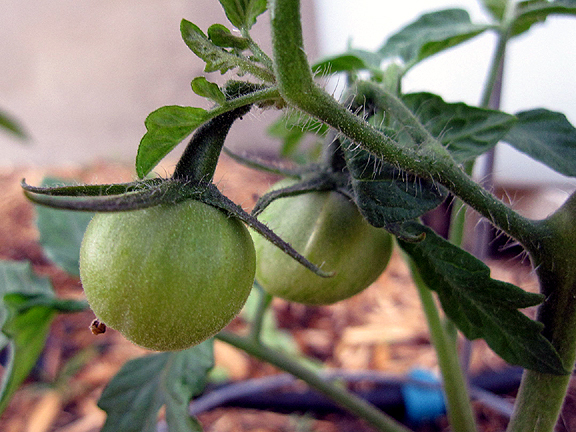 Your tomatoes also are looking good--they all seem to be setting fruit early this year, which means a longer growing season--hooray! Good luck with the bonfire tonight! I think there are fireworks planned to help you celebrate. Very interesting flowers and palnts. I love your cat!! 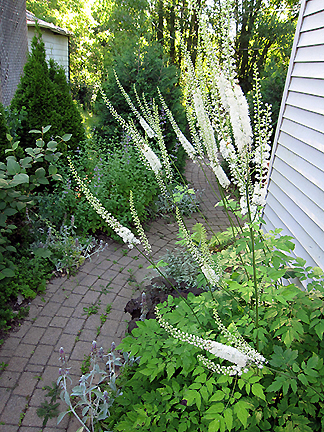 The black cohosh (Actaea (formerly Cimicifuga) racemosa) is on my shopping list. Great plant for the shade garden. 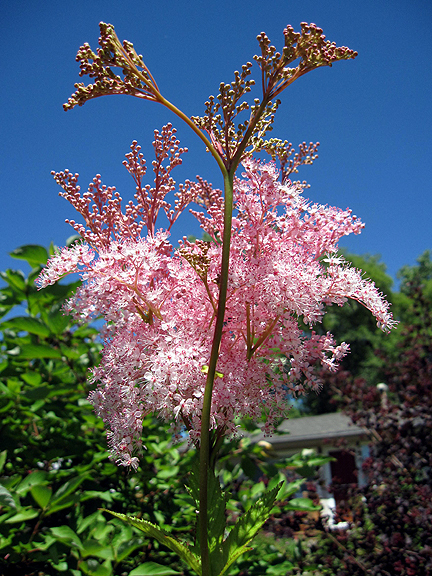 The other pink plant prairie Filipendula rubra needs a lot of sun or shade?? I should try some nasties next year. I was excited this morning when I noticed my first blossom on the tomato you gave me, but looks like I'm still behind the curve. I told Faith that Fiona is celebrating eight years with her human today. She acted nonchalant, but I know she's happy for Fiona. Hey, I didn't notice the fringies before either! How cute! I hate to put a damper on your fun, but I seriously doubt you're going to get any ears on the corn. 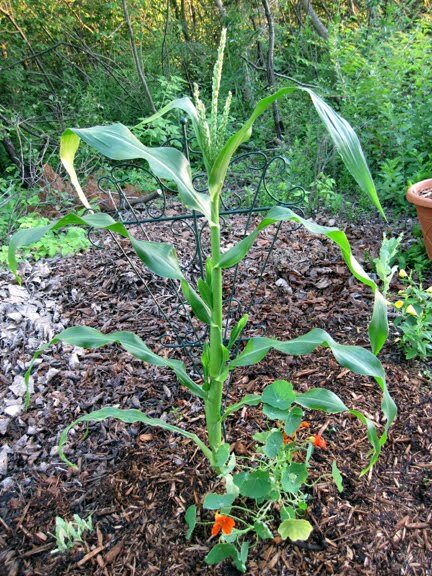 I once grew corn, planted 5 of them in a nice triangular grouping & got only 3 ears. You several plants to get a good yield. I love that Queen of the Prairie! I spotted some while driving yesterday. It's one of those plants I can't grow because it's too dry here. BTW, my cohosh isn't blooming yet either. I enjoyed the tour through your garden. I liked especially the black cohosh. I am assuming you are a Master Gardener. Me too. Hi. Agreed, I must have cohosh now. I didn't know it had such an impressive flower. You have a very nice variety of things in your garden. I need to put some pics of my castor bean plants up. They are really big impact plants too. How pretty is Fiona! Man you sure have a lot of TaLL plants Monica!Great crop of tomatoes!! Beautiful garden, the sunflowers found a strange place to grow. I only planted one tomato this year because of the huge disaster last season. I was happy to see several volunteers also growing and looking pretty good. I've considered growing Cimicifuga but just can't find the perfect place for it. Very striking. 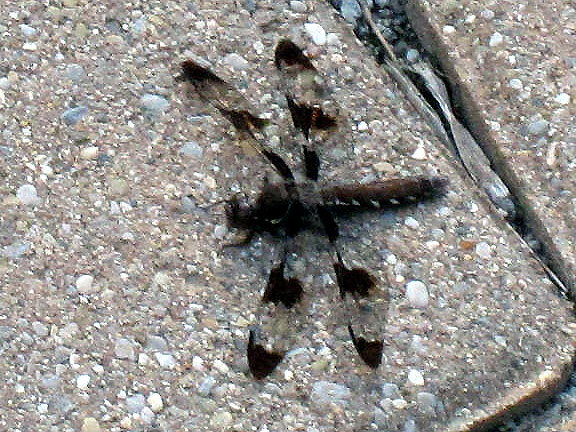 That dragonfly is AMAZING! I've never ever seen one that looked like that! 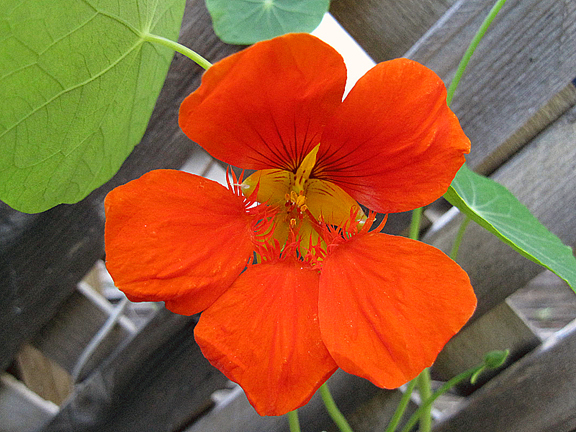 I also grow nasturtium every year. I grow it in a bed that is chock full of seeds. I think most of them come up and they make a really gorgeous display in bulk. You might try if you have a space. 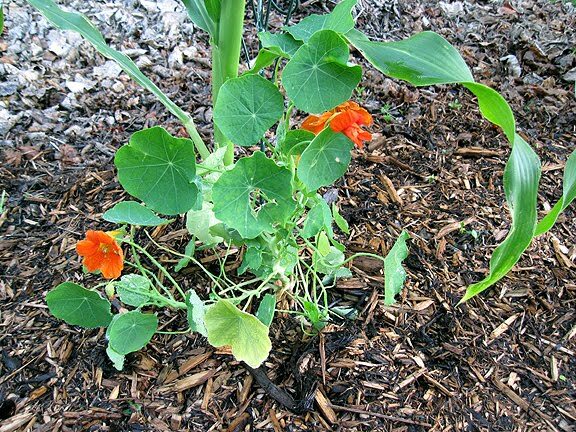 They are very unfussy and will grow in almost any soil as long as they have sun and water. Enjoy! We have the same impact plants blooming now...cimicifuga and filipendula not to mention those pretty nasturtiums. You will be missed at this fling. I think it is time for another cat to adopt me. Yours is very cute. The nasties look great Monica. I love the idea of letting them climb up corn. 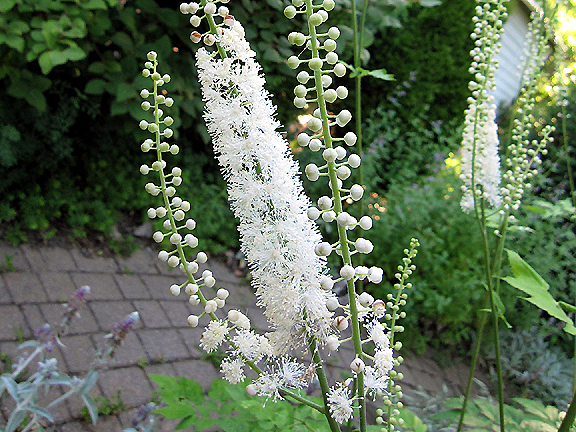 I enjoy my late-blooming Actaea (in odd years with late frosts,) but I do want to add black cohosh for it's much earlier bloom and in keeping with my mission to grow more natives here. 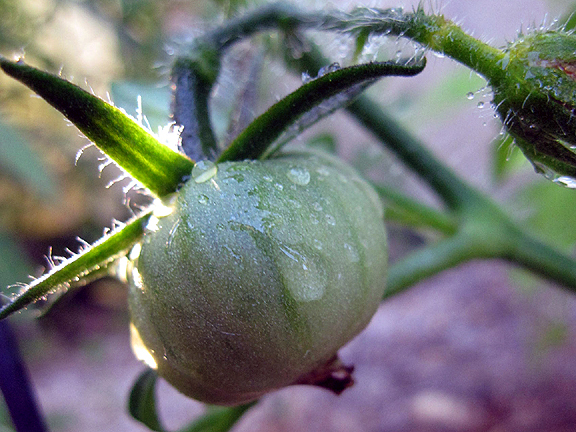 Your tomatoes and well, everything else you've shown in this post is looking wonderful. Good morning! Your feed is not updating on my blog so I had no idea you were posting. Good thing I came by and checked. Is there anything I need to do on my blog? Update your link? Love love love your cohosh and brick path. That is a great use of it. I also have the Queen. Added her last year and she is over 6 feet tall but did not give me so many pretty blooms. It's ok. I'll keep her. Glad to see your nasties are doing well. Good Morning Monica, thanks for stopping by. 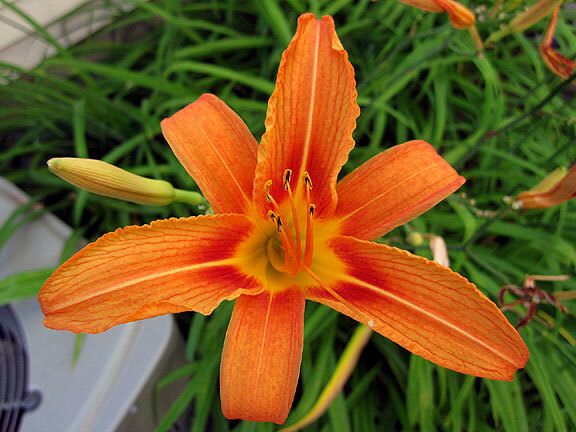 You taught me something today about my lilies, I had no Idea that they were called " Ditch lilies" I'll make a note of that in my garden journal. I just love Dragon flies I would love for my future home to have a creek.. because creeks attract these unique beauties. Nasties, Black cohosh and the other tall violet plants are so pretty in your garden. Can't wait to see what those Uchiki Kuri squash look like when they mature. wow, your nasties are far from it! I just love love love nasturtium foliage. Is that the Japanese black trifele? I'm growing that too, but unfortunately, the hornworms are at it. Kapuzinerkresse hatte sich jahrelang auch bei uns selbst ausgesät. In diesem Jahr ist sie erstmalig nicht wieder gekommen. Im nächsten Jahr werde ich sie wohl neu aussäen. Die süße Fiona hat also Dich gefunden. Guten Geschmack hat sie ;-). Hi Fiona! We just saw you celebrated your Gotcha Day - many concats! Thank you for updating us on James. We don't know what "radiation therapy" means but we don't like the sound of it at all. We hope it will help James though and that it's not too costly for your human. Please keep us updated, okay? 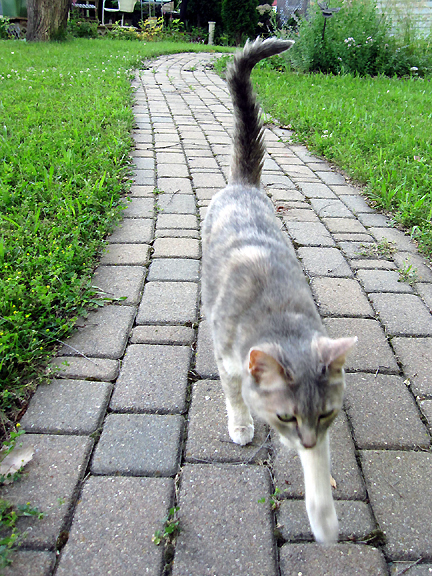 We'll be sending gentle but steady purrs your way. Wow I love your Black Cohosh and Queen of the Prairie. They're gorgeous. I'm envious of your Black Russian tomatoes too. I love them but they don't like it here -- we're lucky to get one crop before they succumb to this or the other. So glad Fiona found you and decided to keep you! Training humans is so hard, but very rewarding. I love, love, love Queen of the Prairie. So very showy. 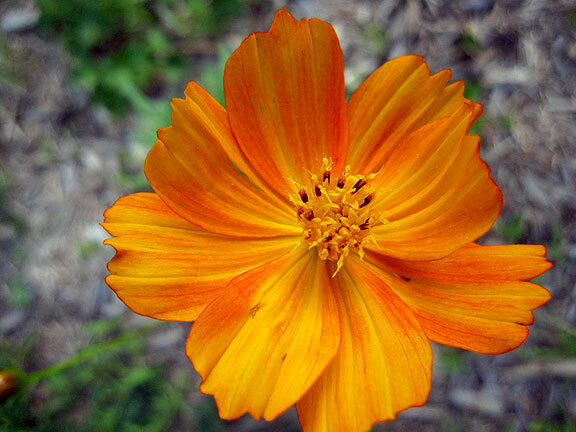 I love the orange Cosmos too--what wouldn't look good with chocolate?